I just finished reading The Things They Carried, by Tim O’Brien. This stunning book is comprised of related short stories that are based on O’Brien’s experiences in Viet Nam. That makes them war stories, but labeling them as such imposes a genre on writing that is so incredible it defies a designation. These stories are of struggle, excruciating choices, love, loss, and celebration. O’Brien’s strong and masterful voice leads you through it all. I found “On the Rainy River” to be especially moving. It’s not that I ever was in a position to decide a matter of such gravity. It’s not that I’ve ever feared being embarrassed or shamed – or ashamed of myself – at such a visceral level. What it is, is that I have been in the position of having to make a decision that would completely alter the course of my life. O’Brien captured every nuance of the wrenching experience – the intense sorrow, the inability to decide, the cries from the soul. I have rarely been so moved. The other stories in the collection were equally well written – although that sounds so lame and tame. The writing in each story grabs you and holds you from start to finish. The short story “The Things They Carried” explores every permutation of “carry” while giving the weight of the physical objects in their packs. The momentum builds. The weight of the objects forms a running total in the reader’s head as O’Brien catalogs the things that are carried voluntarily, the things that are shared, the things that are internal, the things that are expectations… The net result is a total focus on what it means to truly carry anything. My advice? Read this book. Immediately. Then come back and let us know what you think. 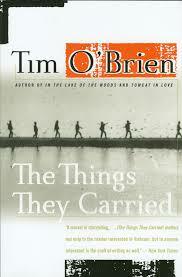 Categories: Blog, MustReads | Tags: On the Rainy River, The Things They Carried, Tim O'Brien, Viet Nam | Permalink. Excellent. Let me know what you think! Definitely 🙂 I just finished a non-fictional memoir, Goodbye Sarajevo, written by two survivors of the war in Bosnia that lasted from 1992-1995. Find some info about here — > http://www.goodbyesarajevo.com/. It really opened my eyes to some of the terrible atrocities that occurred and still occur today. This in my young adolescence I was absolutely clueless about. How blessed are those of us who have been born into circumstances that don’t involve us avoiding bullets every minute of our lives. It’s sobering to think about the difference geography can make.